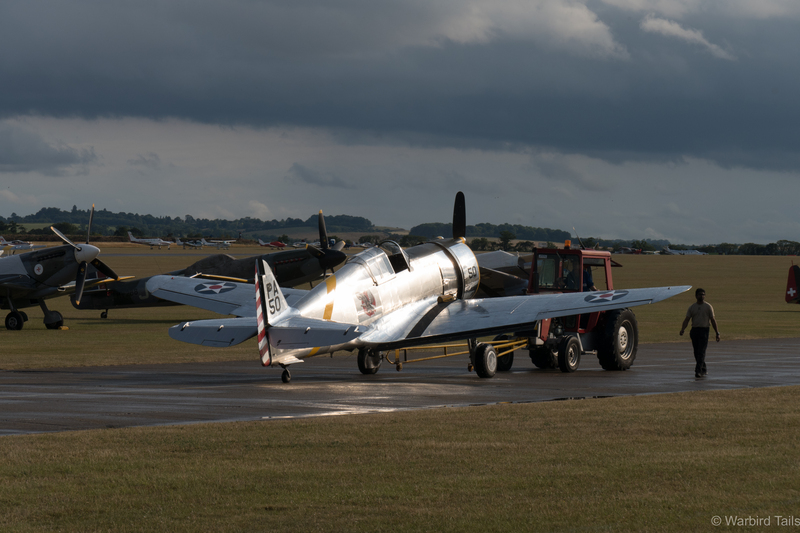 The second weekend in July has cemented itself over the years as an incredibly special time of year for historic aviation enthusiasts. 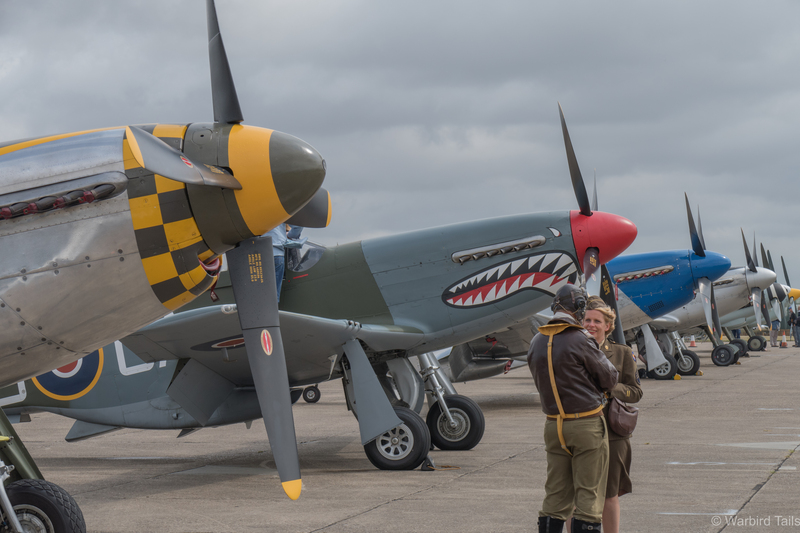 It is around this time each year that Duxford in Cambridgeshire begins welcoming all manner of aeroplanes and pilots from all over the world. Together they form what has to be the greatest warbird display on the planet. The flightline walk always offers a great up close look at the display aircraft. This year was set to be a real stunner, with an amazing list of rare and interesting aircraft, a number of which were making their Duxford debut, while others were making welcome returns after years of absence. The past couple of Legends took a real hit thanks to weather and maintenance issues, meaning that smaller line-ups than planned turned out. One thing that never changed though, regardless of weather or cancellations is the quality of the flying and, more importantly the atmosphere. Luckily this year was blessed by glorious weather, so glorious that I spent most of the week glued to my phone for updates and arrivals! Friday is great for unique arrival formations, such as this pair of Spitfire and Sea Fury. Legends started on the Friday for me, which is traditionally a busy flying day, with arrivals, test flights and practice displays taking place. It proved to be a blissful day with countless movements and practice displays from all manner of aircraft. The highlight of Friday was the three ship aerobatic routine from the three Buchons at the show, led by the Daimler Benz powered Red 7. 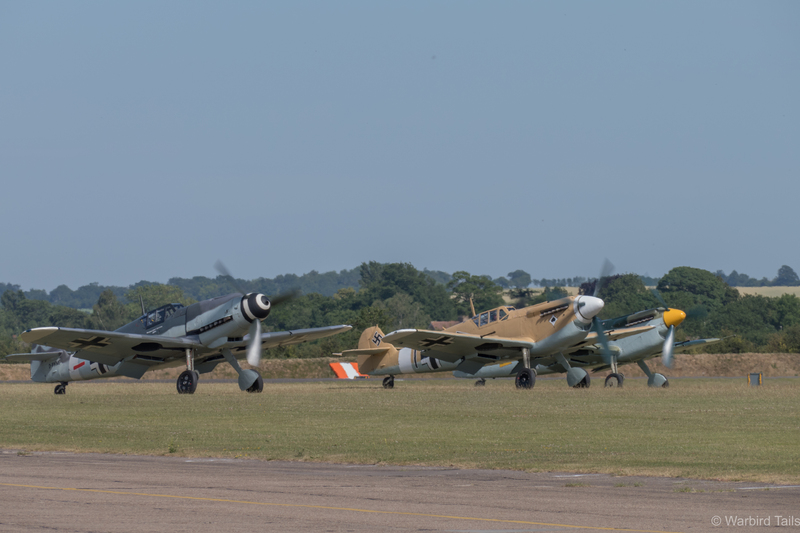 The three Buchons waiting to get airborne for a spectacular formation display. Friday certainly served to whet the appetite, in fact we saw most of the airshow participants in one form of another, with the day capped off nicely by a solo routine from Steve Hinton in my star of the show, The Fighter Collection’s P-36C – 38-210, which looked wonderful in the evening light. Steve Hinton parking up the P-36C. Enough about the pre show days though, as the weekend is of course the main event. I only atteneded on the Sunday this year and was very apprehensive about the forecast, as it turns out I really shouldn’t have been. 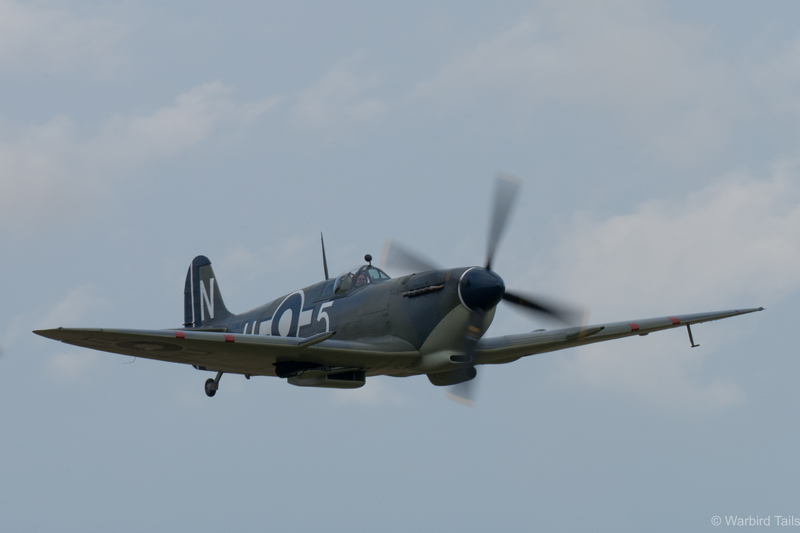 The Seafire III gets airborne prior to the Spitfire segment. After spending the morning wandering around the airfield and stalls we set up camp at the far end of the display line beyond the tank bank, which offers great up close viewing and a wider view of the whole display area. 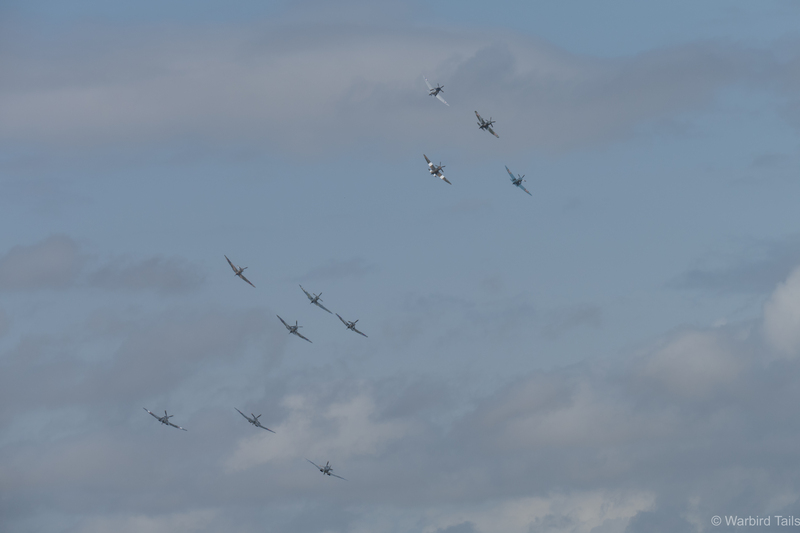 As two O’clock approached the traditional Legends overture began as no fewer than 11 Spitfires lept into the air. 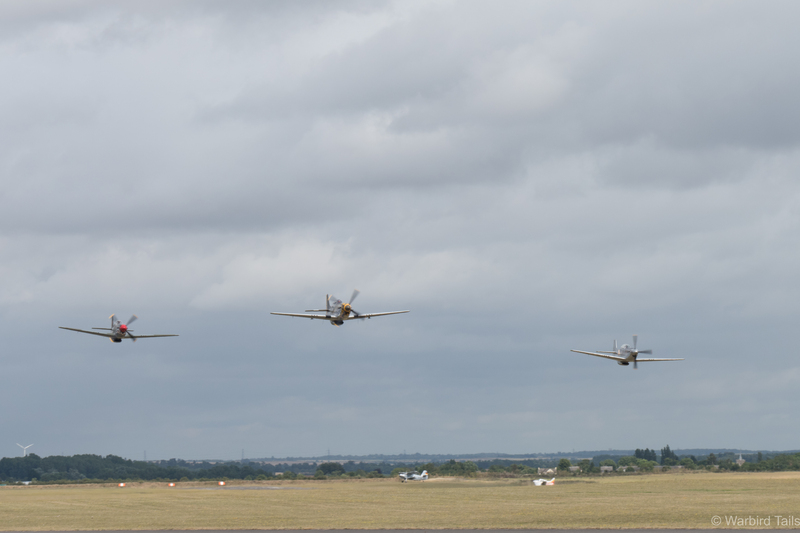 11 Spitfires in formation is always an impressive sight. 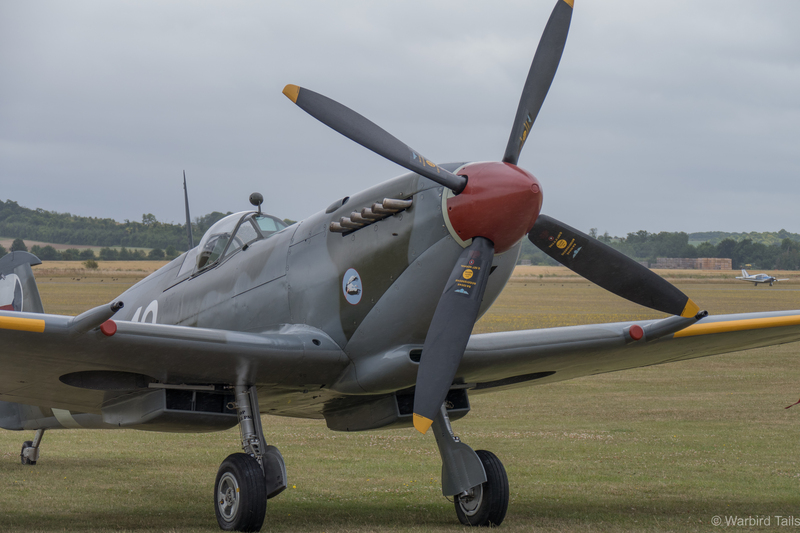 There were too many machines to name all of them here but notable highlights in the Spitfire formation were the 4 Griffon powered machines, courtesy of The Fighter Collection (Mk XIV), Rolls Royce (Mk XIX), Christophe Jacquard (Mk XIX) and Spitfire Ltd (Mk XVIII). Another highlight, making its airshow debut, was Seafire III PP972. The only disappointment was that the Seafire didn’t get its own moment in the spotlight later on in the show, perhaps another time. 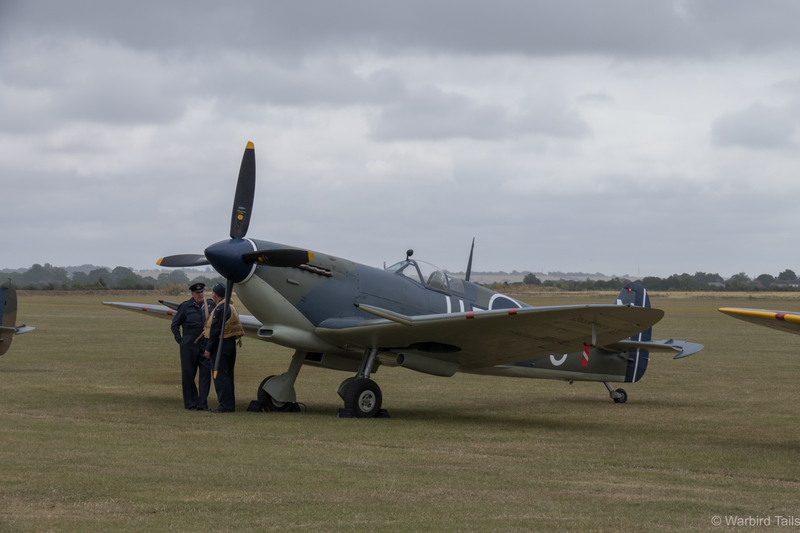 The Seafire certainly looked the part on the flightline earlier in the day. The year saw a subtle twist of the Spitfire routine, rather than a single formation pass before breaking into a tailchase, the 11 ship formation performed some surprisingly dynamic turns in a series of passes before they separated into individual groups. The four Griffons and the earlier Merlin powered examples moved onto the back display line, operating in a figure of eight pattern, with the Griffons understandably disappearing well ahead of the Merlin pack. Using the near display line, getting nice and close to the crowd line, were two Mk. IXs and Max Alpha’s Mk. VIII. One of the Mk IXs was another star visitor, SL633, which is visiting the UK from Seattle for the Battle Of Britain celebrations. Spitfire SL633 is over from the United States. The Spitfire segment was superb as per usual, right from the first act Legends always has you wondering where on earth to look. Evereywhere you looked there were Spitfires, wonderful. 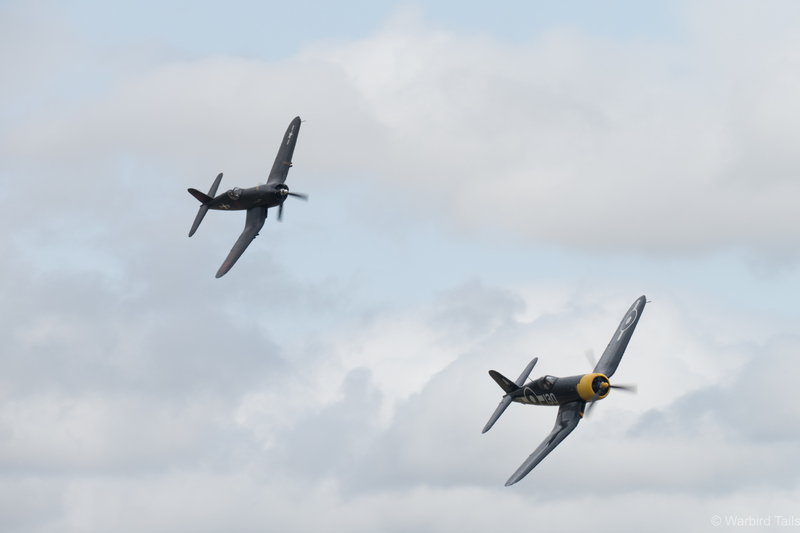 The Corsair pair run in for a pass during their display. As the Spitfires wound down their routine it was time for the next act to get airborne, this time a naval trio in the shape of a pair of Corsairs and the Bearcat. 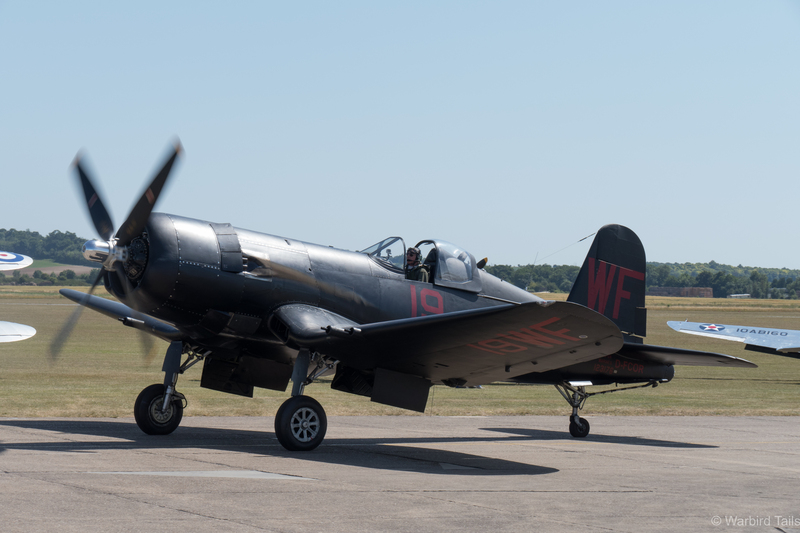 The three aircraft performed a single pass in formation before the Corsairs launched into a loose pairs display, carrying out a number of loops and rolls, accented by low sweeping passes across the airfield. The Bearcat gets put through its paces. 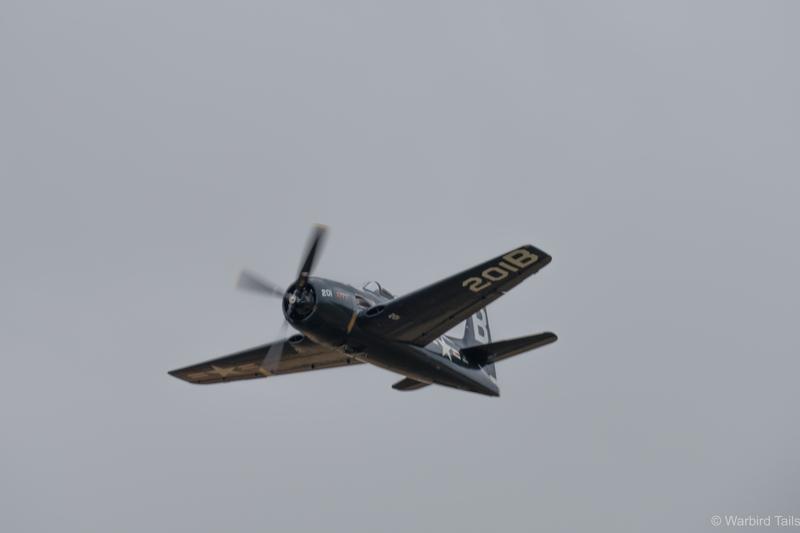 Pete Kynsey put in a star performance in the Bearcat, having the whole airfield to himself he was really able to show what the pinnacle of Piston aircraft could do, with the usual precision aerobatic display. It was great to see this German based Corsair D-FCOR make it to Legends for the first time in a few years. 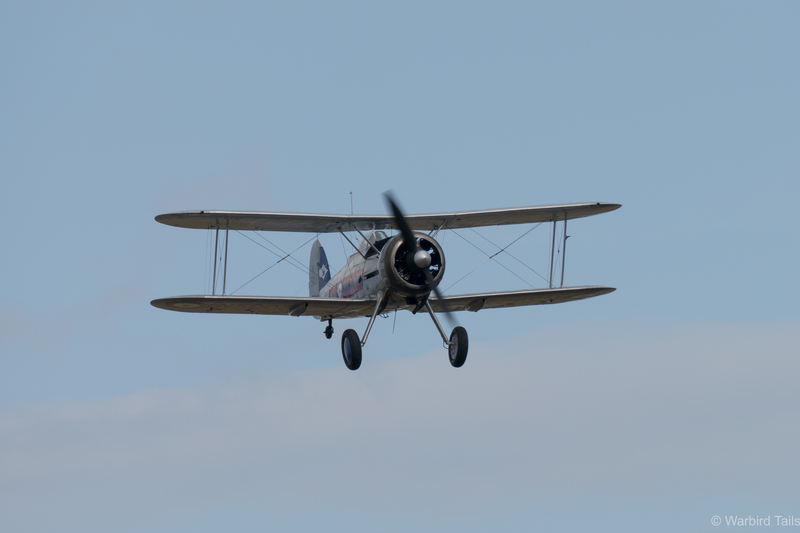 Taking off beneath the Naval sequence was one of the rare treats of the show, the Curtiss formation. This 4 ship comprised of the P-36, H75, P-40B and P-40F. 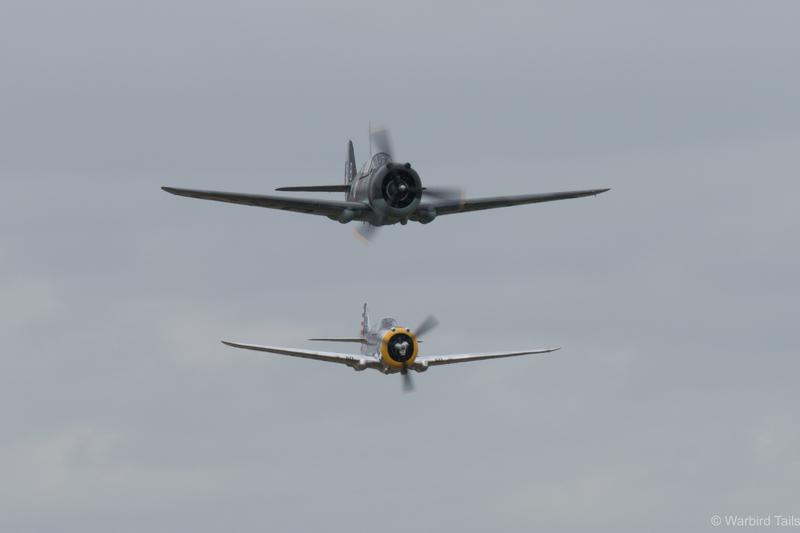 Seeing two P-36/Hawks together is a sight I never thought could be possible, so seeing these two lead the formation in was a real thrill. The P-36 made a great debut appearance. It was a pleasure to see the Hawks given the forward display line as the formation broke up to, giving us a chance to really see Steve Hinton and Patrice Marchasson beat the field up with some very low passes across the grass runway. 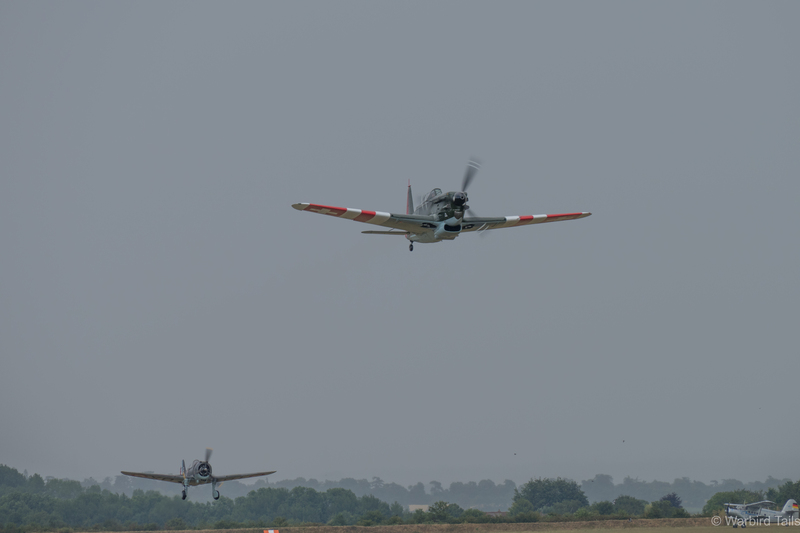 Meanwhile on the back display line, the two P-40s chased each other through some gentle aerobatics. Its a pleasure to see these old fighters, especially when flown so well. Surely the first pairing of H75 and P-36 since the war. Incredible! One of the tricky parts of putting together a Legends report is that each act you remember is a showstopper. 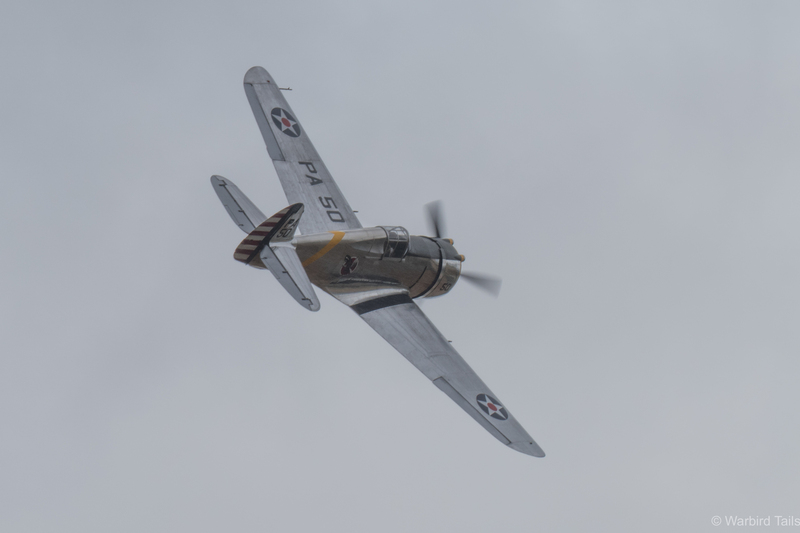 The Mustang 4 ship, led by Nick Grey, has to be one of the most impressive incarnations of this Legends tradition for years with some incredible low flying from Nick Grey, Marc Matthais and Lars Ness close to the crowd. 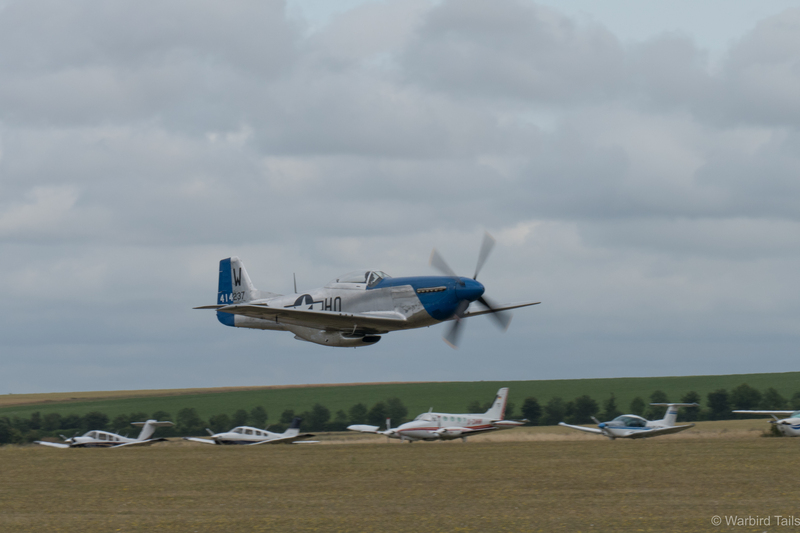 In behind there was a masterclass in Mustang aerobatics by Frederic Akary who did his fair share of low flying as well! Frederic Akary setting the low flying tone for the Mustang routine! Before landing, the Sharkmouth Mustang performed a series of flypasts in formation with Sally B, marking a welcome return for the Little Friends routine, eventually the Mustang peeled off, letting the mighty B-17 finish off this american tribute. The three Mustangs, led by Nick Grey, sweeping low across the field. At this point in the show it was time for the Americans to hand over to the Germans as three acts remembered the Luftwaffe. The three Buchons mentioned earlier began this segment, with a slightly subdued formation routine, thanks to a low cloud base. Once the aircraft separated it was great to see Red 7, the Daimler Benz example performing up close and fast on the close display line. 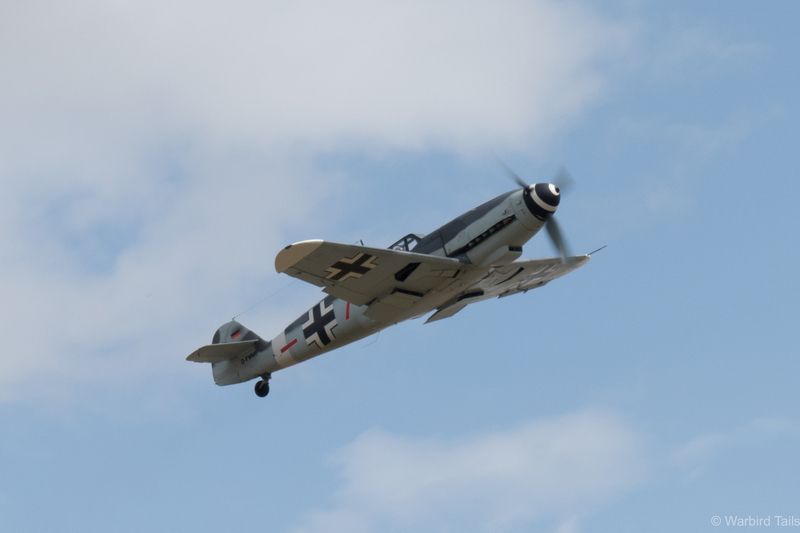 It was great to hear a “proper” 109 at Duxford again. Red 7 climbing to height before its display. The solo routine featured plenty of close passes. 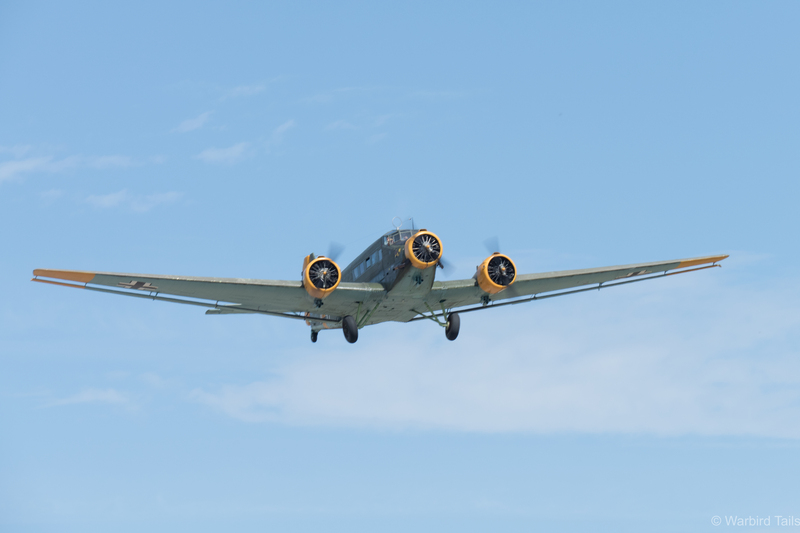 The 109s were followed by a display in classic aerobatics from Anna Walker in her Bucker Jungman, while the La Ferté based JU52 performed lazy circles down below. The JU52 is always a pleasure to watch display. 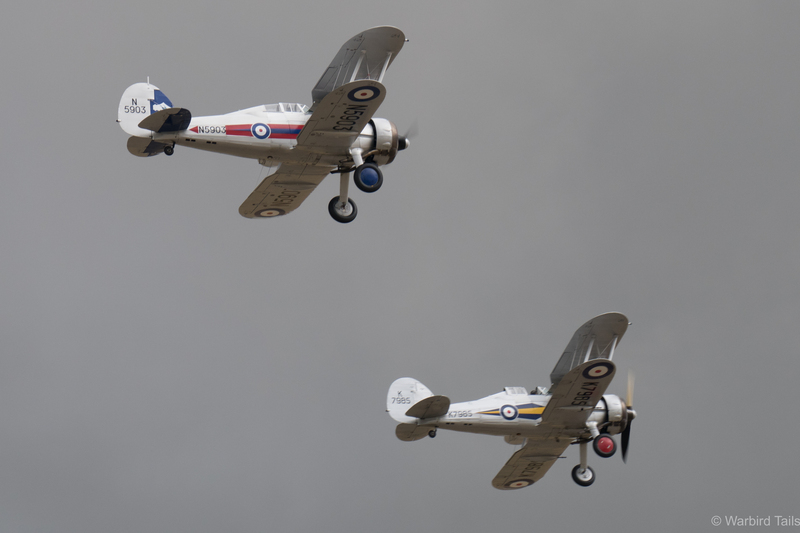 Since the Fighter Collection’s Gladiator made a full return to flying condition in 2013, the Gladiator two ship displays have been an exciting prospect at each Flying Legends display. 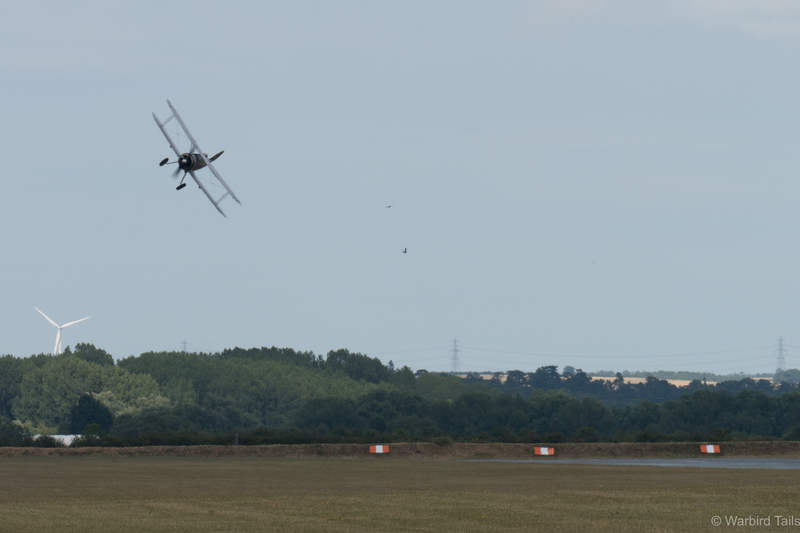 This year kept that reputation, with the Shuttleworth Collection’s example performing a low level swooping display, while Brian Smith performed graceful, high level aerobatics in the Fighter Collection’s example, before re-forming for a series of formation passes. From the Gladiators came an early war British segment. Another aircraft making its Legends debut, at least in its current form, was the Bristol Blenheim. 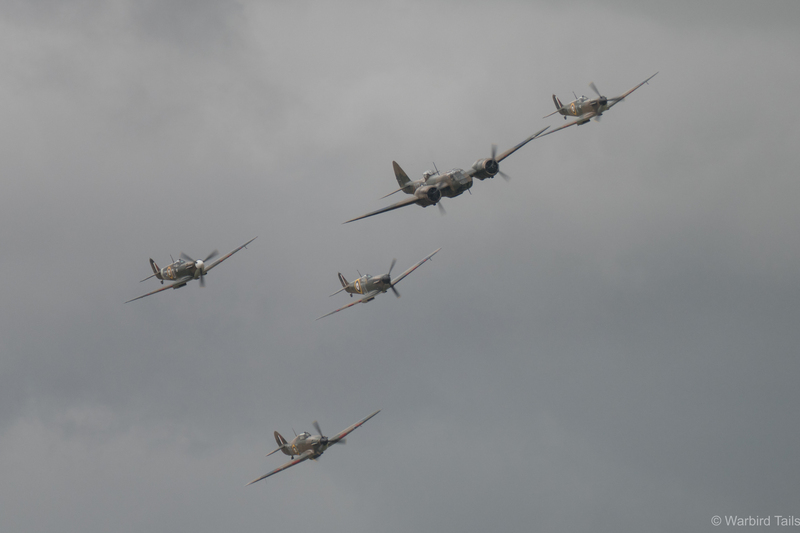 It did so in spectacular fashion as it led in a trio of Mk.1 Spitfires and the Historic Aircraft Collection’s Hurricane. The excellent early war formation, led by the Blenheim. After a couple of formation passes the formation broke up as the Blenheim entered its solo routine, in the hands of John Roamain, after which Dave Harvey displayed the Hurricane. 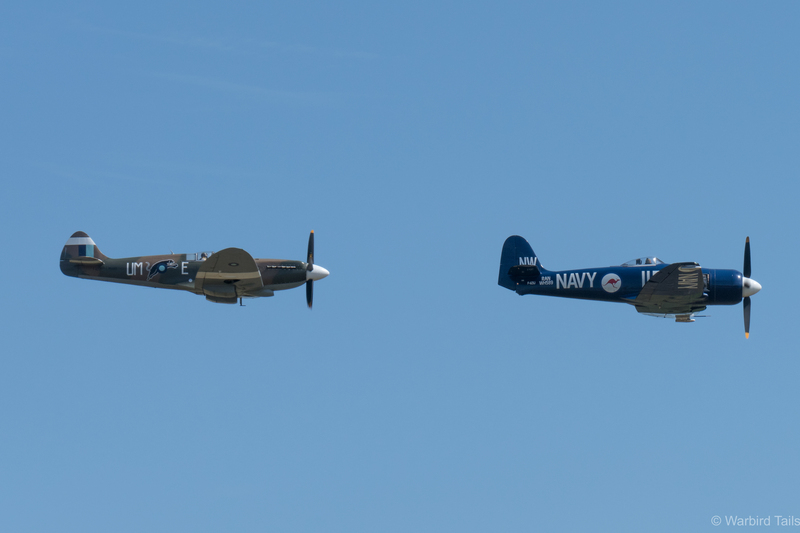 The finale to this early war tribute was the three ship of Mk 1 Spitfires performing a graceful display over Duxford, ending with a classic run and break to land. 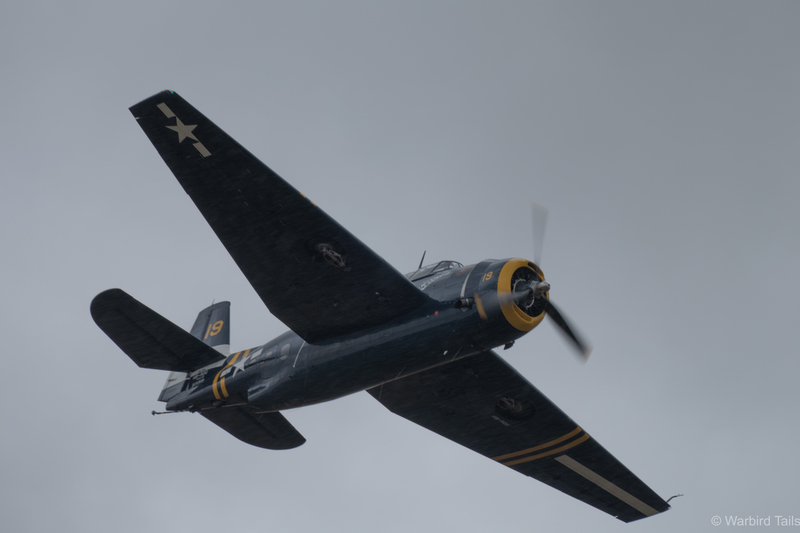 The Avenger fought through some of the worst weather on the Sunday afternoon. The only downside to this display was that it had started to rain! It was appropriate that the next segment featured a pair of Carrier based fighters then. The Avenger and Wildcat displayed simultaneously, with the Wildcat being thrown through a full aerobatic display, impressive given the conditions, while the Avenger performed fast passes in closer to the crowd. It was great to see the Avenger again after missing last year due to weather. On Friday there had been an impressive practice pairs display from the two Sea Furys on show, which I had been looking forward to seeing on the show days, however with Christophe Jacquard’s machine firmly in Hangar 2 it looked unlikely we would be seeing that again on Sunday. As it turns out, due to a horrendus rain shower, we didn’t see either in the main flying display. The rare trio of Hawker Fury and two Hawker Nimrods was scrubbed as well, along with the Cub display as it was announced there would be a 10 minute break to allow the rain to clear. I was fairly skeptical as the rain shower took hold over the airfield as it seemed as though it was set to stay, but sure enough as 10 minutes passed the rain cleared, leaving behind it clear blue skies! I wouldn’t have predicted that on Sunday morning. The Morane leads the Hawk 75 into the gloomy skies. Proceedings continued with a pair of French fighters, in the shape of the Morane MS406 and a welcome second appearance by the Hawk 75. Following the now familiar Legends format the two early war fighters performed a pass in formation before breaking into solo displays. The Morane display was very memorable with some incredibly low passes. It was good to see the Hawk 75 perform an aerobatic routine as well, after its earlier outing with the P-36C. The Flying Bulls were lucky to have some of the best conditions of the day to display in. 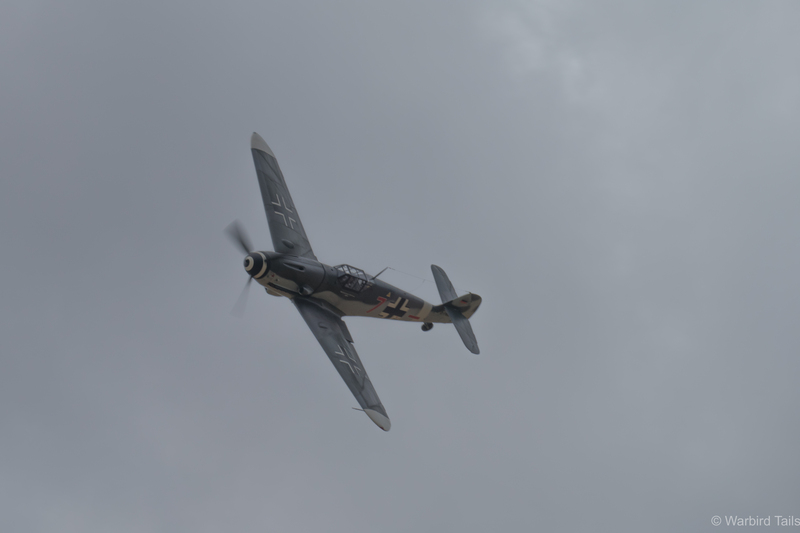 The Flying Bulls haven’t managed to field their full fleet at Legends for a few years now, with only the Corsair and Mitchell making the 2013 and 14 shows respectiviley. 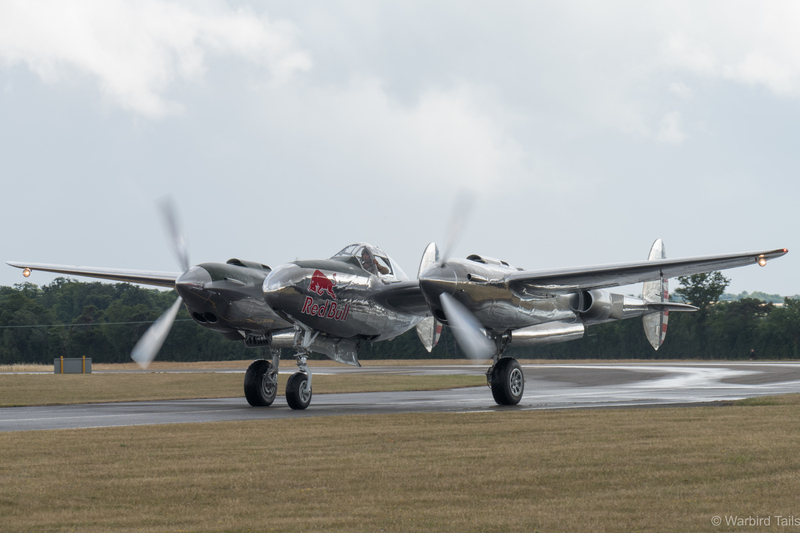 2015 had the promise of the Corsair, Mitchell and P-38 Lightning. Ulitmatley the Corsair didn’t make it, but the P-38 made a welcome return for the first time in 3 years. The Red Bull pair performed an extended pairs routine before breaking into solos. 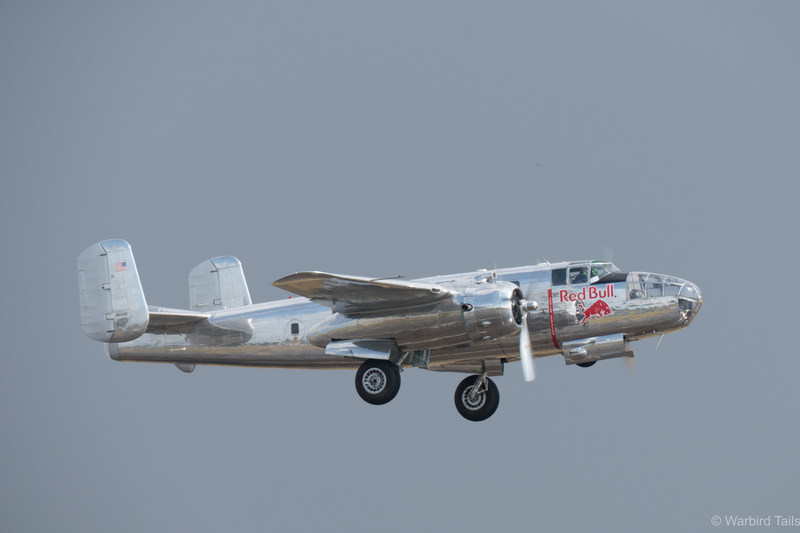 The Mitchell was flown in a style that could certainly compete with the legendary display often performed by the Dutch B-25, including the trademark on crowd wingover. Red Bull’s bare metal warbirds looked great once the sun came out! The star of this sequence, and probably my display of the day was the P-38 which had climbed for height while the Mitchell displayed. Since the Lightning’s earlier outings at Duxford the display routine has really improved, with Raimund Reidman flying some incredibly graceful low level aerobatics, including an impressive opening reverse half cuban. The display was accented well by the addition of a smoke system, which, while out of place with some warbirds really works in this instance. 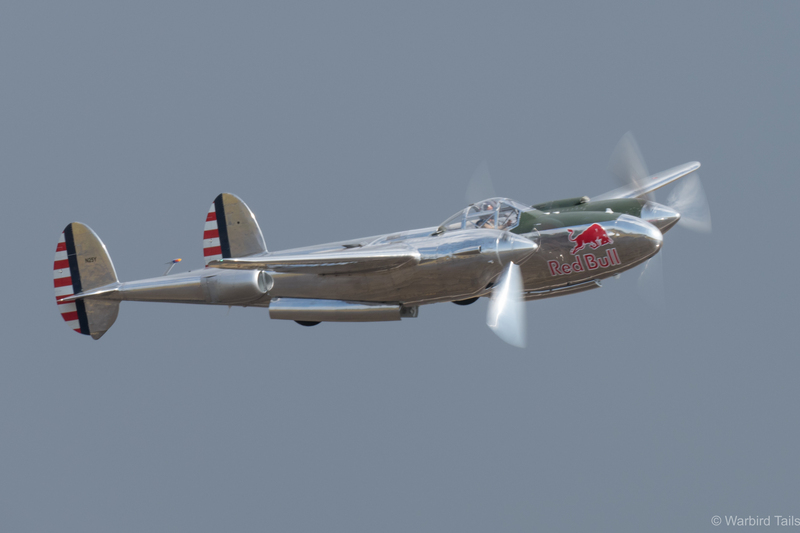 The P-38 solo routine was magnificent. The final display of the main program was the Breitling DC3 which put in a steady display. Perhaps we have been spoiled in recent years by sporty outings from the norweigan Dak but this display seemed slower and more distant. Nevertheless a beautiful aircraft and great to see in the traditional pre-balbo slot. There had been rumours going around at Duxford all morning that the Balbo wouldn’t be taking place due to the weather conditions. However the blue sky which appeared following the rain delay was still over the airfield and conditions just allowed for the Balbo to begin. The wind had dropped as well, which meant we were lucky enough to be able to witness the Joker in the Gladiator. Since 2013 Nick Grey’s solo Gladiator slot has become my must see display so it was a joy to see this display twice over as the Balbo formed up. The Joker routine really is perfect to me, low level passes, turns combined with loops and barrel rolls that seem to use every bit of energy that the classic bi-plane has to offer. Truly Special. The Joker doing what he does best! 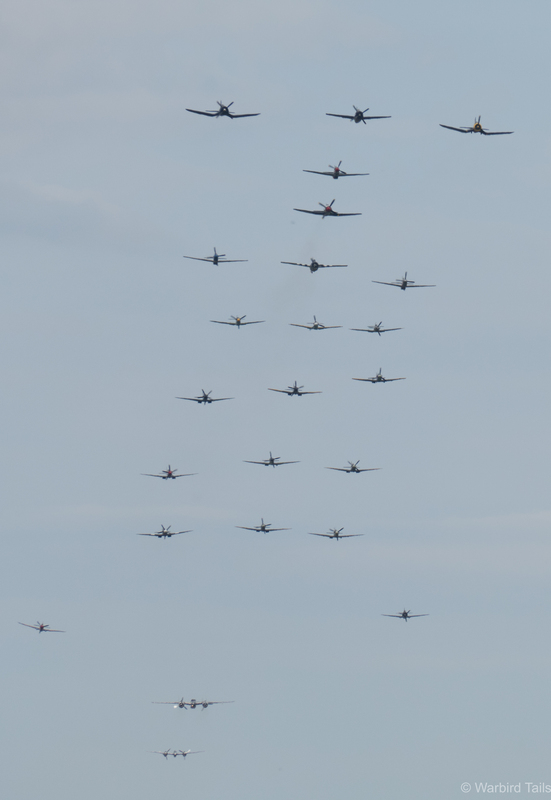 Then came the time for the Legends finale, the Balbo, on this occasion 24 aircraft strong, to pass over Duxford. As usual this made for a magnificient sight and a timeful reminder how lucky we are to have so many of these historic aircraft based in Europe and displaying at one show. Watching the formation get airborne and form up is another of those Legends moments that never gets boring, still holding just as much excitement every year. 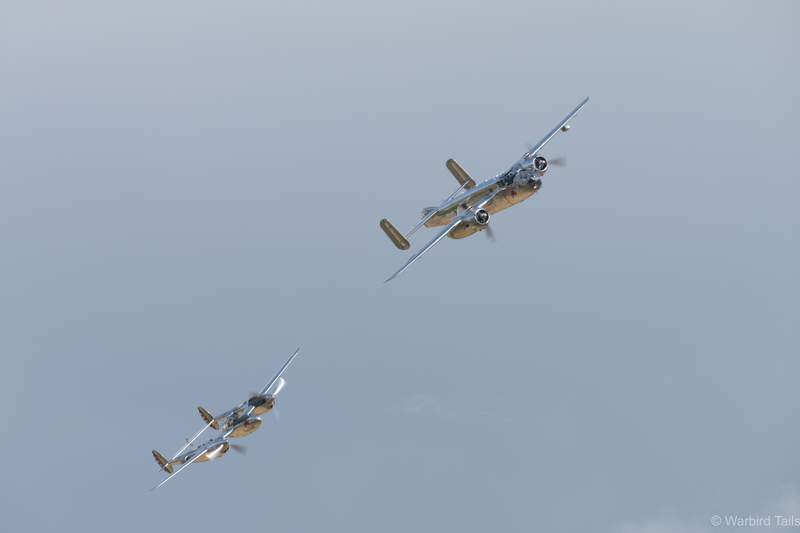 The Iconic Balbo powers over Duxford. In an odd piece of timing as the final aircraft performed their run and breaks to land the clouds came through again, bringing some nasty showers and poor visibility to parts around the airfield. The changeable conditions towards the end of the finale are evident in this shot. With traffic leaving the airfield looking a bit of a mess, not to mention that the M11 was gridlocked, we elected to hang around Duxford and soak in the last few minutes of Flying Legends. A good move as it turned out, we got to watch a number of European visitors leave, including the P38. 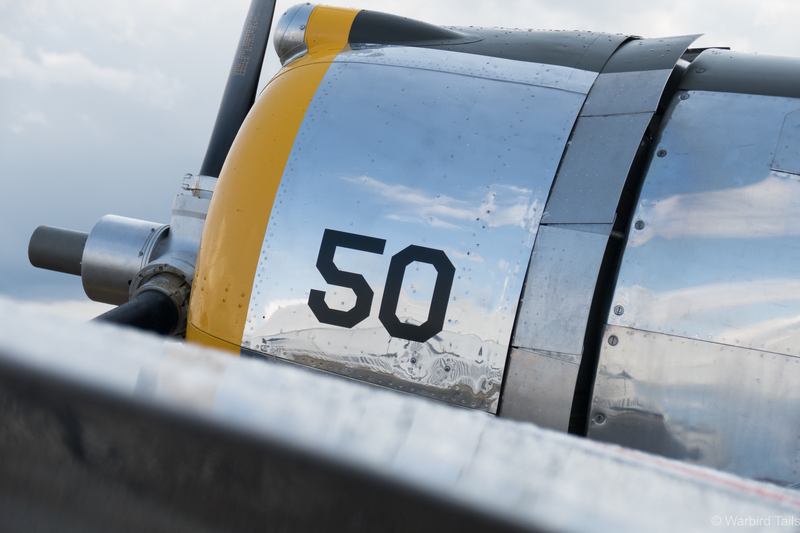 The P-36c is truly stunning up close. 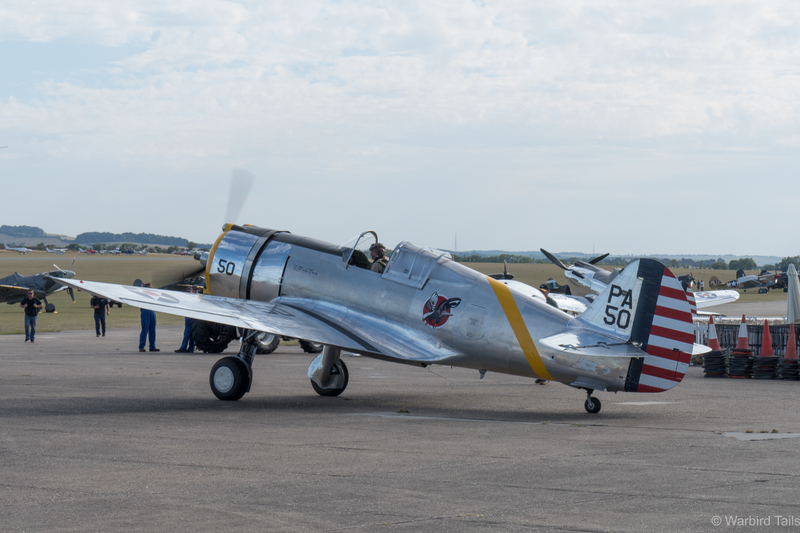 This extended stay also provided one of my moments of the weekend, the new P-36c was towed in from the flightline and sat just on the public side of the gates for a few minutes. This provided those of us who stayed late to get an up close look at this star aircraft and take some photographs in the evening light, what a way to finish. As the sun set on one star of the show, another Legends weekend came to an end. Flying Legends is always a highlight each and every year, this occasion was perhaps their best for some time. An array of star acts and welcome returns combined with some sensational flying made for a truly memorable weekend and I’m already counting the days until Legends 2016. Looks like you had a great time at the show!